It is important that soldiers learn to perform the skills of pushing and pulling efficiently. No more energy should be expended in these movements than is necessary for the accomplishment of the particular task. This conserves resources, postpones fatigue and enables a reserve of strength to be kept for use in an emergency. In addition, the likelihood of injury is decreased in proportion to the degree of physical efficiency and skill acquired. Emphasis must be placed on correct technique so that its application becomes automatic. The type of equipment to be manhandled will vary according to the arm of the service and instructors must adapt the technique of pushing and pulling to meet the specialised needs of units. 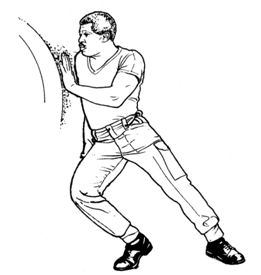 To ensure maximum efficiency when pushing with straight arms there should be, as near as possible, a straight line through the rear leg, trunk and arms (Figure 1). The body should be inclined forward with the leading leg bent, and the trailing leg as straight as possible. This enables the push to be transmitted forward rather than upward. Full use must be made of the thrust from the feet in co-ordination with the power exerted by the back and shoulders to move the object in the required direction, the position of the feet will vary according to the nature of the ground. In soft ground, it will be possible to dig in the edge of the boot, whereas on hard ground the greater frictional surface of the sole of the boot will prove more efficient. In this method of pushing, the principle of the straight line must be observed as far as possible. The shoulders should be placed firmly against the object, the body and legs in line, and inclined at an angle of approximately 40 degrees to the ground. Both legs should be bent, with heels dug well into the ground (Figure 2). The push is made by straightening the legs and moving one foot after the other to obtain a fresh purchase. 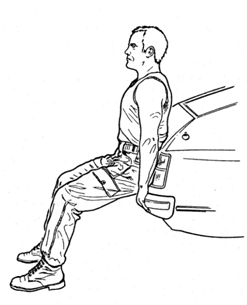 This method may sometimes be used with advantage when moving a vehicle up an incline where the ground is rough. This method may be used where a lift as well as a push is required. The shoulder should be placed firmly against the object (Figure 3). Both legs should be bent although the rear leg only slightly. The push is obtained by straightening the rear leg and the body. If a lift is required at the same time as the push, a suitable grip of the object should be taken with the hands, keeping the arms as straight as possible, the lift results from the combined action of the arms and the forward leg. Positioning on the Rope: when working as part of a team individuals should be evenly distributed along the length of the rope with the shortest person in front and the tallest in the rear. It has been found that best results are achieved with everybody standing on the same side of the rope. Taking the Strain: grip the rope firmly with both hands close together and the arms as straight as possible. The feet should be placed about 12 inches apart with one foot in front of the other. Allow the body to fall back to an angle of about 45 degrees. The lower part of the body should be lifted well up towards the rope and the whole body should be in a straight line from the leading foot to the top of the head. If the body is allowed to sag in the middle, not only is an additional strain placed on the back muscles, but the maximum drive from the legs will not be carried through the body onto the rope. The Heave: maintain the strain on the rope, lowering the angle of the body to about 35 degrees with the ground, and heave by means of a powerful extension of the legs and body. As the load begins to move the feet should be moved back one at a time, taking care to keep them close to the ground. It is important that pullers work in unison to avoid the risk of injury. Sideways Pulling (Figure 5): this is used sometimes as a transition stage between the normal pulling position (i.e. tug-of-war position) and the hauling position, which can be used once the initial inertia has been overcome, and the equipment is on the move. The correct sideways pulling position is achieved by pivoting on the rear foot, maintaining the grip of the rear hand, and turning the body outwards and backwards so that the rope comes to rest across the upper part of the back and shoulders. In this position the arm which is nearest to the equipment should be held sideways in a straight line and the rope grasped with the knuckles uppermost, the other arm should be fully bent at the elbow and the rope grasped with the lower joints of the fingers uppermost. The forward hand should be held at about shoulder height, so that the rope passes from hand to hand in a straight line in rear of the body. The body must lean in the direction of the pull. The heave in this position is the result of a strong drive from the legs. Hauling (Figure 6): participants must be taught to haul as well as pull. The advantage of hauling is that the men can see where they are going. In the hauling position each person is to turn his or her back to the load and place the rope over one shoulder. The arms should be bent at the elbows and locked in front of the body. The hands should be close together with the knuckles uppermost, the back should be straight, and the body should lean slightly in the direction of the pull.